With a unique single concave hull, mid body edge channels, and concave beveled rails, the Liquid Force. Peak Wakeboard offers a finless, rail-friendly ridge that can still hold a solid edge when you need it. An aggressive 3-stage rocker line allows the Peak to not only ollie big, but also lessens the likelihood of catching your tips while spinning onto rails and boxes. For a flexy park board that delivers a lively'bounce' off the water, opt for the full wood core feel of the Liquid Force. Break in rocker curve for an aggressive riding style. Flatter center curve for speed and rail control. Exaggerated exit angle through the tips gives a bucking pop off the wake. (1 Soft - 10 Stiff). Smooth and catch-free on the rails with bite and hold on the water. Liquid Force's elastomeric sidewalls deliver unsurpassed durability and strength for your endless cable park progression. This color coded material moves with your board as it flexes and keeps it together through every hit and rail you dish out. All wood -- precision CNC'd to give you a more spring loaded flex with rebound. Extra strength and extra flex... 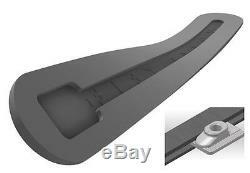 This layup provides you with added torsional rigidity and increased longitudinal flex. Get the strongest base possible while maintaining the performance features of each finely tuned hull shape. Liquid Force's Grind Base molds to the board's contours and provides solid protection all season long. Why have fins if you don't use them. Daniel Grant doesn't so why should you? FlexTrack is the industry's first flexible binding track! The track moves with you and the board as you twist into carves and press onto rails creating an unmatched connection, making you and your board one. 20.5 - 24.5. 21.5 - 25.5. 22.5 - 26.5. 23.0 - 27.0. 52.1 - 62.2. 54.6 - 64.8. 57.2 - 67.3. 58.4 - 68.6. FlexTrack Is The Industrys First Flexible Track! The track moves with you and the board as you twist into carves and press onto rails creating an unmatched connection, making you and your board one! Why Should You Ride A FlexTrack And Why You Should Ride It With A 4D Binding. The answer to this question is quite simple because nothing youve ridden before will compare in terms of how well youll feel connected to your board. A FlexTrack with a 4D binding is the ultimate setup for true response you will feel as if your board and binding are one, not two items pieced together. Liquid Force is driven by offering products that allow you, the rider, to improve your riding skills every time you get on the water. FlexTrack is a tool to help you expand and push the limits on new tricks that might not have been previously possible. You will be amazed at how deep you can press any board with FlexTrack and how quickly the flex will rebound back and spring you into action. The response is truly amazing and we cant wait for you to experience it for yourself. You Dont Already Have A 4D Binding? What are you waiting for? Get yourself a pair of the most revolutionary wake bindings ever designed! If for some reason you cant, dont worry, we still love you and the new FlexTrack is compatible with any standard 6 spread chassis. Does My Old Stance Translate? Not only does your old stance translate, but the new Liquid Force FlexTrack actually opens up the door to micro adjustability. This means you can lightly set your stance, slip your feet in, twist and expand your stance to your own comfort, then lock it in tight! 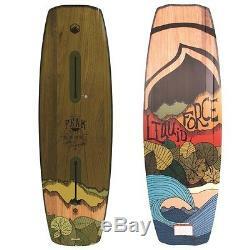 The item "2017 LIQUID FORCE Wakeboard PEAK 141" is in sale since Friday, March 03, 2017. This item is in the category "Sporting Goods\Water Sports\Wakeboarding & Waterskiing\Wakeboards". The seller is "c4wake" and is located in Deerfield Beach, Florida. This item can be shipped worldwide.